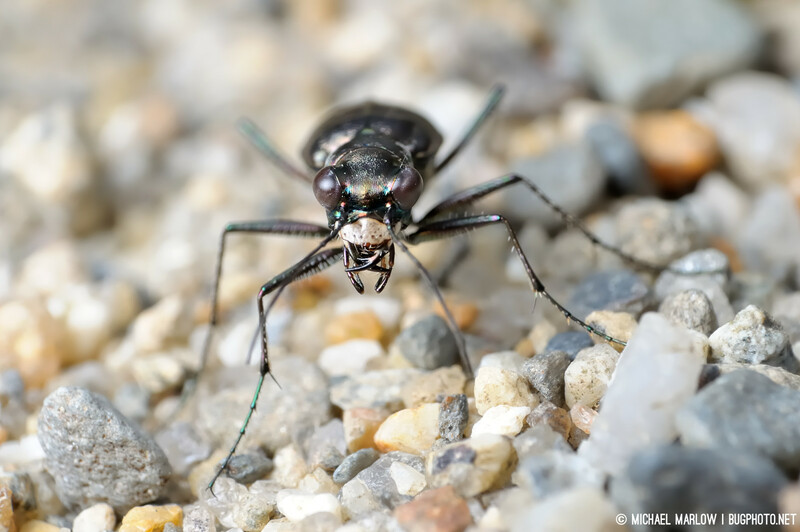 The iridescent and fearsome face of a tiger beetle is a prized shot among insect photographers, because apart from its aesthetic appeal, the insects that these faces belong to are not very cooperative at all. Fast runners and flyers, it usually takes quite a while (and quite a bunch of crawling on all fours or in a prone position, in my personal experience) to get a face-on shot. Black and white version after the break. Posted in ColeopteraTagged black and white, bug face, Carabidae, Cicindela, Cicindelinae, fearsome, insect portrait, Macro Photography, macrophotography, monochrome, tiger beetleBookmark the permalink. Such a crisp image Michael, very impressive! How fast are they? Easy to keep up with? Thank you! No, they are not easy to keep up with. Well, actually they will stay still but each one will have a limit. Maybe you can get a couple meters away or even a 30 centimeters, but when you cross their line they take off. The key is to find the less wary ones and wear them down a bit. It’s usually a lot of chasing around in my experience, and it’s not easy because to get a shot that isn’t pointing down you have to get on all fours or your stomach. Such dedication! Haha, do you get many passers by asking what you were doing? I imagine they could bite and give you a nasty one welt or cut, but I think that would be a last resort for them. You’d probably have to be holding one between your fingers for it to try that. Nice capture. Looks like you may have had some muted lighting that allowed you to get the detail of the dark beetle without blowing the highlights on the ground. Not always an easy thing to do. Yes I think you may be right. I think that was the day I walked for hours on end hounded by mosquitoes, and not finding much else bug life on a cloudy day, before chancing on a patch of tiger beetles. Apparently the crawling on all fours put me over the edge because I threw out my back. But I got the shot, so I can’t complain.